Students from all over Québec protested in the streets of Montreal against tuition fee hikes. Quick: name the Canadian Prime Minister. If you got it, congratulations. Otherwise, don’t worry. Those of you who drew a blank, or who took an uncomfortably long time to come up with an answer, are within a safe majority in the United States. Given this long-standing neglect of Canada, maybe it’s no shock that it took some 100 days of massive, concerted protest before the student strike in Québec finally started getting traction in the U.S. media. Maybe the surprise is that it broke through at all—and that the strike may yet provide a resonant example for young people in this country suffering an epidemic of student debt. Students at French-speaking universities in Québec have a stronger history of activism than their Anglophone counterparts, and French-language media gave the story serious coverage in its early months. It’s always interesting to watch a social movement become a mass media phenomenon, as the Québec student strikes have started to become in the last week. It is rarely remembered that Occupy Wall Street was a virtual non-story through its first week, even in most of the alternative press. Many of the stories that did run sentenced that movement to irrelevance. It was only around day nine or ten of the occupation in New York City, after some startling video of police abuse started circulating online, that journalists decided that this was something they should be paying attention to. The movement snowballed from there. The lack of attention wasn’t due to a lack of numbers. Hundreds of thousands in Québec had rallied on March 22. That’s more than either the Tea Party or Occupy ever turned out for their protests—and the Québécois were drawing from a much smaller population. The strike has been supported by near-daily protest actions ranging from family-oriented rallies to building occupations and bridge blockades, and, more recently, by a campaign of political and economic disruption directed against government ministries, crown corporations, and private industry. Although generally peaceful, these actions have met with increasingly brutal acts of police violence: Student protesters are routinely beaten, pepper-sprayed, and tear-gassed by riot police, and one, Francis Grenier, lost an eye after being hit by a flashbang grenade at close range. Meanwhile, college and university administrators have deployed a spate of court injunctions and other legal measures in an unsuccessful attempt to break the strike, and Québec’s premier, Jean Charest, remains intransigent in spite of growing calls for his government to negotiate with student leaders. In part, the protesters didn’t need the U.S. press. Students at French-speaking universities in Québec have a stronger history of activism than their Anglophone counterparts, and French-language media gave the story serious coverage in its early months. But that’s no excuse for the English-speaking media’s slow response. In a move indicative of a leadership grasping for control, the provincial government passed Law 78 in mid-May. Attempting to end the strikes and force the reopening of the universities, the law in no uncertain terms makes protest illegal. Groups planning demonstrations with more than 50 expected participants, according to Law 78, must inform the police in writing at least eight hours in advance of the protest with details of time, location, size and duration. More perturbing still, expressing support for demonstrations and strikes deemed unpermitted under Law 78 renders one guilty of that offense and liable to face the same steep fines. Last week, coinciding with the 100th day of the student strike, massive crowds took to the streets in defiance of Law 78. 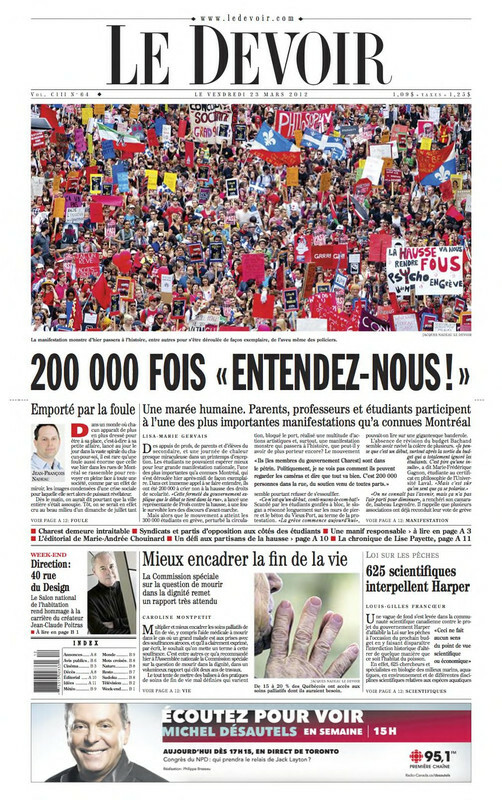 Organizers hailed the demonstrations of Tuesday, May 22, when as many as 500,000 people marched wearing red squares (the symbol of the protest), as the largest act of civil disobedience in Canadian history. Daily protests have continued, and total arrests from the strike now exceed 2,500. In the wake of the strike’s hundredth day, I was pleased to see stories about the Québec students start popping up like spring tulips, with viral videos like this one sprouting widely through Facebook feeds. Thank you; you are a little late to the party, and you are still missing the mark a lot of the time, but in the past few days, you have published some not entirely terrible articles and op-eds about what’s happening in Québec right now. Welcome to our movement. The author is right to call out the smug op-eds that have appeared. There are plenty to choose from. Social movements in Québec have long helped keep the cost of tuition low, and this is now being used against the students. Since they pay less than students in other Canadian provinces, the argument goes, young people in Québec must be insufferable whiners if they object to rising fees. This is the same logic with which all unionized U.S. workers with decent health care and pensions are told they should have to give up these benefits upon entering a contract fight, since so much of the workforce doesn’t get them. It is the local incarnation of neoliberalism’s famous race to the bottom. Kudos to students in Ontario, who pay some of the highest tuition in Canada, for refusing to buy in. Instead of begrudging neighboring Québecers their lower fees, they’re ready to demand some for themselves. And given that the strike seems only to be gaining momentum, they might not be the only ones outside Québec to join in protest against crippling student debt. Better late than never. I’m putting on my red square. Michael Nagler on building a movement to build a new reality. Sure, we teach democracy in our schools—but we need to practice it there, too.